We’d love your help. Let us know what’s wrong with this preview of The Tusk That Did the Damage by Tania James. Orphaned by poachers as a calf and sold into a life of labor and exh From the critically acclaimed author of Atlas of Unknowns and Aerogrammes, a tour de force set in South India that plumbs the moral complexities of the ivory trade through the eyes of a poacher, a documentary filmmaker, and, in a feat of audacious imagination, an infamous elephant known as the Gravedigger. 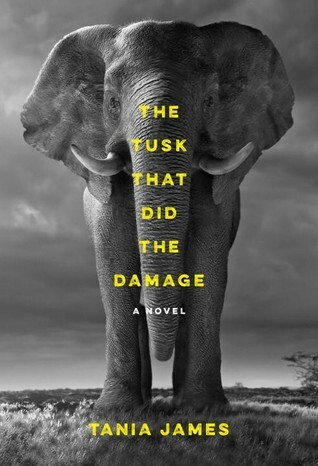 To ask other readers questions about The Tusk That Did the Damage, please sign up. There are always multiple ways to look at any situation—this novel gives us three: the elephant’s point of view, the poacher’s, and the Western film maker’s. There is truth in all three. I was a volunteer natural history teacher for 17 years—you can take the woman out of the classroom, but you can’t take the teacher out of her. I immediately began recommending this book to the folks I know who are still manning the ramparts and educating the public. The only viewpoint that is missing from this bo There are always multiple ways to look at any situation—this novel gives us three: the elephant’s point of view, the poacher’s, and the Western film maker’s. There is truth in all three. I was a volunteer natural history teacher for 17 years—you can take the woman out of the classroom, but you can’t take the teacher out of her. I immediately began recommending this book to the folks I know who are still manning the ramparts and educating the public. The poachers are often folk who live a tenuous existence, barely providing the basic necessities for themselves and their children. If you’ve studied psychology, you may remember Maslow’s Hierarchy of Needs—people need to have their basic needs met, and feel safe that they will continue to be met, before they can care about higher level ideals like wildlife conservation and biodiversity. And if you were ever in any doubt that cultural sensitivity is necessary as a foreigner in a country on the other side of the world, this book will bring that lesson home. The film makers may think their film is about elephants, but it is also very much about the people whose lives intertwine, for good or ill, with those immense mammals. Recommended for those who love elephants, who champion wildlife conservation, and for those who love India. (Nearly 3.5) This composite picture of the state of wildlife conservation in India is told from three perspectives: an elephant named the Gravedigger, a poacher, and a documentary filmmaker. James ably intersperses three voices as she explores how people fail to live up to their ideals and make harmful assumptions. Despite these attributes, it was one of those books I had to force myself through. Perhaps it was the environmental agenda: if a book is going to wear its message so openly, it has to (Nearly 3.5) This composite picture of the state of wildlife conservation in India is told from three perspectives: an elephant named the Gravedigger, a poacher, and a documentary filmmaker. James ably intersperses three voices as she explores how people fail to live up to their ideals and make harmful assumptions. Despite these attributes, it was one of those books I had to force myself through. Perhaps it was the environmental agenda: if a book is going to wear its message so openly, it has to live up to it in terms of the writing. I might have preferred it if the whole novel had been from Emma’s point of view, with one climactic encounter with the Gravedigger to make the poaching question immediate and not simply academic. A wonderful and unusual book. One of the three viewpoints, that of the documentary filmmaker, could've used a bit more development, but other than that, the whole book is spot on. Really enjoyed it. More like 3.5★ for me. I've been wanting to read this story of elephant conservation for a while, knowing that it is told from 3 different points of view; the poacher, the rather green documentary maker, and the elephant itself. But after having my fingers burned by Ceridwen Dovey's Only the Animals earlier this year (where she has also written from the animals' POV) I wasn't sure whether I was going to like it. Happily, Tania James has taken a slightly different approach, which is, I think, a l More like 3.5★ for me. I've been wanting to read this story of elephant conservation for a while, knowing that it is told from 3 different points of view; the poacher, the rather green documentary maker, and the elephant itself. But after having my fingers burned by Ceridwen Dovey's Only the Animals earlier this year (where she has also written from the animals' POV) I wasn't sure whether I was going to like it. Happily, Tania James has taken a slightly different approach, which is, I think, a lot more successful. The writing is beautiful and the story engaging, but overall I actually would have liked it to be a little longer! Because although the ending was quite breathtaking, it left me with lots of questions about what happened next. It took a while to gather my thoughts on this one, and I'm not sure I've done so sufficiently now. I enjoyed this book overall. I loved having Gravedigger's perspective, but I think those sections could have been meatier. It never got deep enough. There was just enough to begin empathizing with the elephants, but there needed to be more. I wish Gravedigger had more sections, too. There was not enough focus on him. I also appreciated the POV's of the poacher and his brother. I cared less about the filmmakers because their story barely had anything to do with the elephants. It was more about her romance. It's just that I've already read two elephant books this year. What can I say...this book has left me absolutely speechless ~ Such a beautiful, heartbreaking, devastating and captivating novel! The story of a tribe of elephants in South India, those who want to care for and protect them, those who are willing to exploit them and outsiders looking for a story. It is a clash of cultures, of people and species who have forgotten how to live in harmony and are having to live with the consequences of their behaviours. The narrative follows the elephant they name Gravedigger, seized as a young calf after his mother is cruelly shot; a young American film maker Emma, trying to make her name by c The story of a tribe of elephants in South India, those who want to care for and protect them, those who are willing to exploit them and outsiders looking for a story. The narrative follows the elephant they name Gravedigger, seized as a young calf after his mother is cruelly shot; a young American film maker Emma, trying to make her name by creating a worthy work in collaboration with classmate and friend Teddy and the Indian veterinarian Ravi; and Manu, the younger brother of an ivory poacher, who tries to look out for his brother, at the request of his mother. The story moves between the three narratives, following their lives, looking back at the events that have shaped them until now, leading them towards each other and the inevitable confrontations that beckon. There is an authenticity to the narrative of the younger brother that has the effect of drawing the reader deep into the lives of his family and neighbours, that his story involves more than just himself may be one of the reasons I was captivated by these sections. The insights into the perceptions from the elephants point of view are sensitively if briefly handled, I wished this narrative voice could have been even stronger. The filmmakers felt unnatural in the environment, lacking understanding, empathy and not spending sufficient time to learn anything, they were the major weakness in the narrative for me. This is a novel that takes place in present day India. Told from three perspectives - that of a film crew, poachers, and an elephant known as The Gravedigger - the reader is privy to the problems and issues facing the survival of elephants. The film crew is in India to follow a veterinarian named Ravi who is a specialist in elephants. There are two filmmakers, Teddy and Emma. Teddy is enamored of Emma but Emma begins an affair with Ravi which jeopardizes the objectivity of the documentary they ar This is a novel that takes place in present day India. Told from three perspectives - that of a film crew, poachers, and an elephant known as The Gravedigger - the reader is privy to the problems and issues facing the survival of elephants. The film crew is in India to follow a veterinarian named Ravi who is a specialist in elephants. There are two filmmakers, Teddy and Emma. Teddy is enamored of Emma but Emma begins an affair with Ravi which jeopardizes the objectivity of the documentary they are making. The poachers are part of a network that takes tusks from male elephants and sells the ivory. The poachers are small-time hunters who are used by the larger network. One of them ends up in jail for four years. His brother tries to stay out of the poaching business but his mother asks him to keep an eye on his brother and he ends up instilled in the hunt. We are learn about the life of The Gravedigger, an elephant who kills humans and then buries them. He watched as his mother was killed and then he was taken prisoner and used as an attraction for various events, always chained and sometimes tortured. When he breaks out of his chains, he takes his revenge. This book started with the potential to reel me in and become one of those addictive books I couldn't put down. Yet for some reason it didnt work that way for me. I seemed to loose momentum toward the middle of the book but thankfully it recaptured my attention and overall I rated it as a solid 3.5 stars. According to the saying every story has two sides yet in this book we clearly heard and came to understand three sides of the story of the unsavoury topic of poaching elephants in India. T This book started with the potential to reel me in and become one of those addictive books I couldn't put down. Yet for some reason it didnt work that way for me. I seemed to loose momentum toward the middle of the book but thankfully it recaptured my attention and overall I rated it as a solid 3.5 stars. According to the saying every story has two sides yet in this book we clearly heard and came to understand three sides of the story of the unsavoury topic of poaching elephants in India. This was possible through the use of alternating narratives from the elephant, the poacher and some documentary film makers. We got a first hand view of the harsh life and some of the cruelties the elephant had been exposed to and appreciated how those same actions lead to the consequences for which he became a target. We learnt of the poachers early greed for selling ivory on the black market, his imprisonment, some losses to rogue elephants and an ultimate plan to exact revenge. Meanwhile the documentary makers get caught up in some relationship issues, as well as uncovering some conservation and political issues. I love stories with animals. Even when they are portrayed as cruel, as unstoppable, untamed forces of nature, I love their stories. This is no exception. It is a lyrical, evocative portrait of an elephant treated wrong, side by side with the story of a surprisingly sympathetic poacher. I was one of those little kids who never had the guts to approach a temple elephant no matter how much my parents and other adults egged me on, and this book justifies my fear. I loved the way it was written, with I love stories with animals. Even when they are portrayed as cruel, as unstoppable, untamed forces of nature, I love their stories. This is no exception. It is a lyrical, evocative portrait of an elephant treated wrong, side by side with the story of a surprisingly sympathetic poacher. I was one of those little kids who never had the guts to approach a temple elephant no matter how much my parents and other adults egged me on, and this book justifies my fear. As a zoologist, I found James' book one of the best examples of the struggle between animals, poachers, and the people who try to save them. It is clear that Ms.James took a lot of time and effort to research the subject before writing about it from a fictional standpoint. I found the story of Gravedigger to be heartbreaking, and even on some level, I felt empathy for the poacher (strange considering my line of work.) An absolutely masterful job, in my opinion. Very well worth time to read. The novel starts with a scene cribbed from Babar the Elephant but what follows has none of that book's insights. I got wind of this book a few months ago and was luckily able to order this book on its release date. I began reading it as soon as it arrived in the mail, and I must say score! I devoured this book in less than a week. This book has many underlying themes but the one theme that stands out to me is memory as perspective. There are three major narrators with various different perspectives in this book: a poacher, a filmmaker, and, most interestingly, an elephant. Both the filmmaker and poacher's point of views are told in the first person, but the author decided to tell the elephant's story in third person. I am not sure why James made this choice, but the story, in my opinion, could have been much stronger and gone into so much more depth had she taken this route. Moreover, while definitely, an interesting perspective, I could have done without the 23 year overprivileged filmmaker. But maybe that was James's whole point, maybe she threw in that perspective because the story needed to be told from an outsider who was more interested in capturing a story for instant fame and wealth. Maybe James wanted to prove the point that much of what we see, read, and hear, even history books is told from an outsider perspective. Just as the filmmakers wanted to manipulate the story of the elephants much of history is manipulated and missing so many perspectives--ultimately, ignoring memory. Much of history is told from perspective of outsiders. Perhaps, James includes the filmmaker's narration because often, as westerners, we hear or see issues occurring in other parts of the world and minimize the experience by saying things like, "why don't they just fight back?" or "If I were there I would do things differently." Ultimately, we make assumptions without understanding the various perspectives. As I read this book, I was consistently reminded of the how indigenous cultures, animals, and the environment have been wiped out because of actions of humanity. The plight of the elephants reminded me of those moments in history; for generations, elephants lived uninterrupted but it was the humanity that changed their existence. According to the tale, elephants lived a good life until the tusk appeared. The, humanity was overcome by greed which lead to the ultimate demise of the elephants.Did the elephants want to be violent or were they forced because of their fate? Much of these issues can also be brought up through the stories of imperialism. While there are several bad reviews of this book circulating out there, I highly recommend this book. It brings up so many global issues that everyone needs to be more educated about. This book is by no means perfect, but Tania James masterfully intertwines all three narrators together in shocking twist that will definitely captivate readers. This book is so much more than a story of an angry elephant-it is about betrayal, loss, prejudices, and perspective. If anything, this book is an important testament on the importance of storytelling to understand our own histories. The Tusk That Did the Damage by Tania James is a highly recommended novel set in southern India, that covers the illegal poaching of ivory through three unique viewpoints. These three viewpoints are presented in alternating chapters. The first viewpoint is that of the elephant which the villagers now call the Gravedigger. He witnesses the killing of his mother, after which he is captured, loved, trained, and abused. He later escapes, which is when he becomes The Gravedigger and is a source of fea The Tusk That Did the Damage by Tania James is a highly recommended novel set in southern India, that covers the illegal poaching of ivory through three unique viewpoints. These three viewpoints are presented in alternating chapters. The first viewpoint is that of the elephant which the villagers now call the Gravedigger. He witnesses the killing of his mother, after which he is captured, loved, trained, and abused. He later escapes, which is when he becomes The Gravedigger and is a source of fear and hatred. The second viewpoint is the poacher, Jayan. This section is narrated by his younger brother Manu, who has been asked to look after his older brother. Jayan is attracted to the money he can make through poaching, although he tries to hide his illegal activities from his family at first. They would prefer he worked hard at farming. Gravedigger has already killed one member of their family. The third viewpoint is that of the filmmakers, specifically Emma. Emma and Teddy are Americans in India to film a documentary about a vet named Ravi at an elephant sanctuary. They are trying to capture on film his technique for reuniting baby elephants with their mothers, who are known to disown babies who smell of human contact. A love triangle develops between the three. James succeeds admirably in the chapters told through Gravedigger's point of view. I was sobbing like a baby over some of these sections, which are gruesome and heartbreaking. She brilliantly captures how a sentient being would react and be traumatized by seeing their mother killed, and then being captured and trained by the same kind of beings who did the act. She also evokes the sensory world of an animal and the resulting confusion his capture would cause. These are the strongest chapters in the book. Although not quite as compelling, the chapters told through the poachers point of view are certainly enlightening. The financial reality of poverty and the money that can be made through poaching is brought out, as well as the problem of elephants destroying the farmer's crops. Certainly the actual poachers are low on the list of those who benefit from their illegal acts. The least successful chapters are those of the filmmakers. James is an excellent writer and the prose flows beautifully, managing to portray each individual, their struggles, pain, and confusion, along with the questions of morality the narrative begs we ask. She manages to capture the clash of man and nature in an individualized way, but, in the end, it is also a rather depressing tale. I decided to really take my time with this one because I didn't want the fact that I've recently encountered a cluster of underwhelming books to be the reason that I was finding this one to be underwhelming as well. After finishing it I have no doubt that it was just this book. The story is told from three perspectives. We have a reluctant poacher and a naïve filmmaker giving first person accounts, while the account of a fearsome serial killer elephant known as Gravedigger is told in third person I decided to really take my time with this one because I didn't want the fact that I've recently encountered a cluster of underwhelming books to be the reason that I was finding this one to be underwhelming as well. After finishing it I have no doubt that it was just this book. The story is told from three perspectives. We have a reluctant poacher and a naïve filmmaker giving first person accounts, while the account of a fearsome serial killer elephant known as Gravedigger is told in third person. Gravedigger is so named because of his tendency to bury his victims. I was far more invested in the elephant's chapters than those about the poacher and filmmaker. Learning more about this sad and unusual character was what kept the story going. Unfortunately for me, it felt like Gravedigger's chapters were too few and far between even though they're actually every third chapter. Other than the elephant's chapters there were two short folktales nestled within the story that I found interesting. The rest I struggled through. My first red flag went up when the filmmaker's love life was brought up. Her personal drama is silly and boring. It merges with the overarching story, eventually, sort of, but the connection wasn't strong enough for her chapters to be so long and detailed. I found the poacher to be a more interesting and complex character, and yet his story is also filled with banalities that quickly made me lose interest. It's hard not to like a book on elephants. Definitely hard not to like a book which looks at life from the perspective of an elephant without anthropomorphising emotions. The book is amazing - she makes you want more of the stories of elephants, makes you want to sit down with Old Man and listen to his stories, the ones he's heard from his Appachan, the ones about elephants and their pappans. (a huge Thank You! for not using "Mahout" throughout the book - in Kerala, there are pappans, pronounced It's hard not to like a book on elephants. Definitely hard not to like a book which looks at life from the perspective of an elephant without anthropomorphising emotions. The book is amazing - she makes you want more of the stories of elephants, makes you want to sit down with Old Man and listen to his stories, the ones he's heard from his Appachan, the ones about elephants and their pappans. (a huge Thank You! for not using "Mahout" throughout the book - in Kerala, there are pappans, pronounced "paappan", not mahouts, which comes from a Hindi word.) She makes you want to be more inside the head of the elephants, and converse with other elephants. Such amazing, spiritual creatures! And she gets them like no other authors, giving them their own mind, own stories - that have been passed over generations - and that's the best part, to have stories passed over generations between elephants. The story of Manu, the brother of the poacher, is equally good. She gets the idea of poachers being pawns in a bigger game, of their own worries about elephants running into their fields, of the disappearance of Bamboos in the forests, which sustained all those herds over hundreds of thousands of years. Despite all this, you feel sold short. You come off unsatisfied because the third angle, of the filmmakers from the US, just does not fit in. It feels like something external, inorganic that has been plugged in, and almost always affects the flow that the other two narratives establish. Honestly, I found this book confusing. I understand the whole "there are multiple sides to every story" approach, but I feel like James' intent was to make it impossible for the reader to choose a moral right. This did end up being truly impossible because she left out so much in the way of necessary details that would allow one to make such a choice. Instead, I'm left feeling lost and also, somehow, like I'm in the wrong for not being led to the "inevitable" conclusion that sometimes there is n Honestly, I found this book confusing. I understand the whole "there are multiple sides to every story" approach, but I feel like James' intent was to make it impossible for the reader to choose a moral right. This did end up being truly impossible because she left out so much in the way of necessary details that would allow one to make such a choice. I liked the book, really, but....and there's always a but! This story is told from three perspectives - the elephant's, the younger brother of a poacher from an impoverished Indian family, and that of an American college film-maker. The elephant's and Indian boy's perspectives were, I thought, well executed and engaging. The film-maker, her partner, and the Indian veterinarian whose work they are filming all seemed like stick figures invented to alternately explain or make speeches. After finishing the book I felt like I'd just read a review, not the book itself; it skittered along the surface and didn't get deep enough to satisfy. An exquisitely written, meticulously researched, riveting story about the world's tragic propensity for self-destruction, told from the perspectives of a young man drawn into the unseemly world of poachers and black-market ivory traders, a documentary filmmaker conflicted about the moral compromises of dramatic storytelling, and the murderous elephant who looms over James' narrative. This book is a winner! This isn't just another book with multiple connected points of view. James' stories at first share obvious subject matter (elephants) but it's unclear whether they're told at the same time or how they'll come together. I loved that about it. Each story is also unique in tone and style, unlike many of these stories where each section feels the same. The book is about the people who kill elephants and the people who try to save them. But it's also a unique novel that really stands out. A book told through three perspectives, and one of them is that of an elephant's? Perfect. Or, at least, it should have been perfect. The Tusk That Did the Damage by Tania James is a competent and lyrical story about the toll the tusk trade takes, and the story is told through three different perspectives: a group of documentary filmmakers, the poachers, as well as the elephant. Among the three, the filmmakers' story feels the most divorced from the other two — at least until the end. The elepha A book told through three perspectives, and one of them is that of an elephant's? Perfect. Or, at least, it should have been perfect. Among the three, the filmmakers' story feels the most divorced from the other two — at least until the end. The elephant's perspective, while intriguing at first, fumbles a bit in the middle when it switches to the perspective to the elephant keepers rather than the elephant itself — what's the deal, James? At the beginning of the elephant's POV, you see everything from his perspective. He witnesses his mother gets killed by poachers, and you see him being captured for the sake of a rich businessman. Even human dialogues are represented as gibberish or exclamation marks because, well, elephants don't understand humans. Then, for some inexplicable reason, James decides to switch the perspective to an old elephant keeper and his protege for some reason, which sort of betrays what made the book interesting in the first place. Out of the three POVs, I feel that the poachers' story is the most engaging. It's easy to portray poachers as the villains in a story like that, but I think James does a great job at making the characters sympathetic in this case. You really come to emphathise with why the brothers had to do what they did, even if it means to hunt down and kill an elephant. My feelings about poaching are pretty one-dimensional, in the sense that I loathe it in every way possible. Being one-dimensional isn't the best way to go about writing a book, so Tania James told the story of elephant poaching from multiple perspectives, in an attempt to offer different outlooks on something most people feel universally the same about. The first perspective is through the eyes of an Elephant, who experiences tragedy as a calf and is raised in captivity. Then there are two film m My feelings about poaching are pretty one-dimensional, in the sense that I loathe it in every way possible. Being one-dimensional isn't the best way to go about writing a book, so Tania James told the story of elephant poaching from multiple perspectives, in an attempt to offer different outlooks on something most people feel universally the same about. The first perspective is through the eyes of an Elephant, who experiences tragedy as a calf and is raised in captivity. Then there are two film makers shooting a documentary and interviewing the man who works with captive elephants. Finally there is a boy who lives in a poor village, with his brother who poaches elephants to make ends meet. Initially, I thought it seemed pretty obvious how I would feel about the book. The elephant's experience would be heartbreaking, and I would hate the poachers every time I had to read their chapters. In that regard, the author did a great job of actually making me feel sympathy for the poachers. While it didn't change my stance on the subject, what is important that the book has depth, which is hugely important for readability! Ironically, the elephant chapters really started bogging down about midway through the book for me. I also wasn't super enthusiastic about the film makers either, which doesn't add a lot to the story until the very end and is mostly just used for relationship drama. Fortunately the 3 separate plot lines do all come together in the end, but there was a point about 100 pages into the book where I was really only interested in 1 of the 3 groups. I won this book in a Goodreads giveaway. I enjoyed it, especially the different points of view. I have been reading a lot of books about elephants lately and when The Tusk That Did the Damage hit my radar, I knew I wanted to read it. The Tusk That Did the Damage takes place in India and is told from three different perspectives. The elephant, the poacher and the filmmaker. The Elephant also known as Gravedigger begins his story by talking about the death of his herd. Memories haunt his everyday life as he witnesses the death of his family and he is captured and put into captivity to entertain others. The poacher tells his brother's story. It is complex and full of revenge because the Gravedigger took the life of their 17 year old cousin Raghu. You must know the story of their life for you to understand their role as poacher. The filmmaker is an American in India making a documentary on elephants and the Vet who treats them. From behind the camera and in conducting interviews, she tries to piece together the truth. Tania James is an excellent writer who has crafted a thoughtful, complex novel that speaks of current day issues. The elephant is becoming endangered as poachers hunt them for the ivory in their tusks. Elephants are powerful creatures with an amazing memory and a matriarchal society. Poachers are being paid high wages to rid their farmland of animals that wreak havoc on their crops and livelihood in India. The Tusk That Did the Damage is a page-turning, can't wait to find out what happens next, sort of book. It is devastatingly beautiful and tragic and brilliant. I have fallen in love with Gravedigger and the poacher and the filmmaker. My heart aches for each of them and I wish the story didn't have to end. Unfortunately every story must come to an end and so this is my recommendation; Read slowly and tell everyone you know to read it. The The main character of the novel is a rogue elephant known as Gravedigger—so named because he buries his victims after he kills them. Gravedigger was barely a few years old when he was orphaned by poachers who attacked his clan and killed his mother. He was captured and eventually sold as labor to the lumber trade, then again as transportation, and again as ‘entertainment’ in a traveling show. But he has now escaped; he cannot forget the years of mistreatment and is seeking revenge on humans. The story slowly builds as the reader begins to empathize with the characters and each of their situations. Almost immediately I sympathized with the elephant and his various plights, and this was my favorite section of the narrative. The other two points of view were not as compelling which, for me, made the story feel a little choppy. However, that did not hinder me from the enjoying the book. What research went into this novel! I appreciate the result. However, is that actually an Indian elephant on the cover? I thought those are supposed to have tiny ears. Ojh. Okay. It seems they have ears of varied sizes. I found the plot straightforward. I did not find it as "devastating" as a review on the back cover suggests. Maybe that just reflects poorly on me as a human being, though. My sister often says I'm cold-hearted. Anyway, I think The Tusk That Did The Damage gives you a glimpse of I What research went into this novel! This novel delves into the complicated relationship between men and elephants in Southern India from an inside and outside perspective. The book is broken into three main voices - Gravedigger, a male elephant tortured by the death of his mother, an American filmmaker looking to bring the elephants of a sanctuary and rescue to the screen and the brother of an ivory poacher who has just lost a family member to Gravedigger. Though these three storylines are mostly fragmented from one another, the w This novel delves into the complicated relationship between men and elephants in Southern India from an inside and outside perspective. The book is broken into three main voices - Gravedigger, a male elephant tortured by the death of his mother, an American filmmaker looking to bring the elephants of a sanctuary and rescue to the screen and the brother of an ivory poacher who has just lost a family member to Gravedigger. Though these three storylines are mostly fragmented from one another, the writing in each is surprisingly strong. Each perspective - even the elephant’s - has a genuine cadence to it (I would love to listen to an audioversion to see how these voices are handled) and feels very polished. It’s a bit slow at the start, largely because of the lack of connection between the voices, but the pacing does pick up quite a bit. It isn’t a long novel - barely over 200 pages, but it contains some powerful imagery and some truly striking sentences. It’s an impressive novel and one that I am happy to have picked up, despite my initial misgivings about the rather slow and disjointed beginning.